A die is said to be a specialized tool that is used to cut and shape different kinds of metals for different purposes. Dies are designed for the materials they are used for. Products made with dies vary from paper clips to sheet metal of cars. In fact, the automobile industry is one of the heaviest users of the tool. 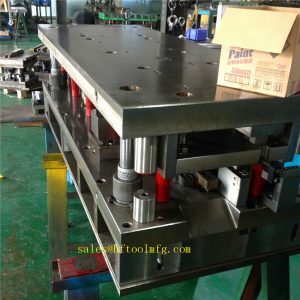 However, the progressive die stamping is the commonest in the automobile manufacturing industry. A progressive die stamping consists of several separate work stations. Each of these work stations performs a different function on the part. There are several companies that produce progressive die for sheet metal for cars but some of them offer better products and services than others. So, you need to be careful when selecting your progressive die supplier. A very good way to choose a reliable progressive die stamping supplier is to have a chat with about three suppliers before picking one of them. Do not make the mistake of picking the first one you talk to. It is often a bad idea as you can’t possibly make reasonable comparisons by talking to just one supplier. This is because there might be better deals out there. Besides, the very first prospective supplier will definitely sound like the best. Of course, he will be the best until you come across suppliers with better terms of service. And how can you come across a better supplier if you don’t interview more than one prospective supplier? You need to choose a die supplier that has been in business for a long time. There is no trade where experience does not count. Experience comes with so much expertise and variety. This is why the first quality to consider in your prospective die supplier is experience. Sometimes new progressive die suppliers inflate their years of operation just to attract new customers. So, you need to request a proof on this. Other trick that inexperienced suppliers adopt is by offering ridiculously low prices. This is why you should be careful of overly low prices. It could be a pointer to low quality products. Another surefire way to get a very good progressive die supplier is through reference from reliable sources. You could ask friends, colleagues and family members. If you don’t get a good contact, you can throw it up in different online forums. You should get a lead. Another quality to look out for in your die supplier is a responsive customer support team. You can assess this by putting a call through to your prospective supplier. A reliable supplier should have your call picked at the first call. In fact, any prospective supplier that does not pick your call at first attempt and also fail to call you back is not reliable. That is exactly how you will be left hanging when you run into a serious issue.